Many fans were surprised when Final Fantasy XIII’s pink-haired heroine traded in her Firaga in favor of being a fashion model. In a completely made-up interview given exclusively to UK’s Telegraph, Lightning reveals how significantly pricey clothing has changed her life. Fans called Lightning modeling purses and other items designed by Louis Vuitton creative director Nicolas Ghesquière absurd. They said that Sera, Lightning’s less hard-edged younger sister, would be a more appropriate representative for the fashion house. Lightning addressed those concerns today in an interview delivered exclusively to The Telegraph via the fashion house’s marketing team. 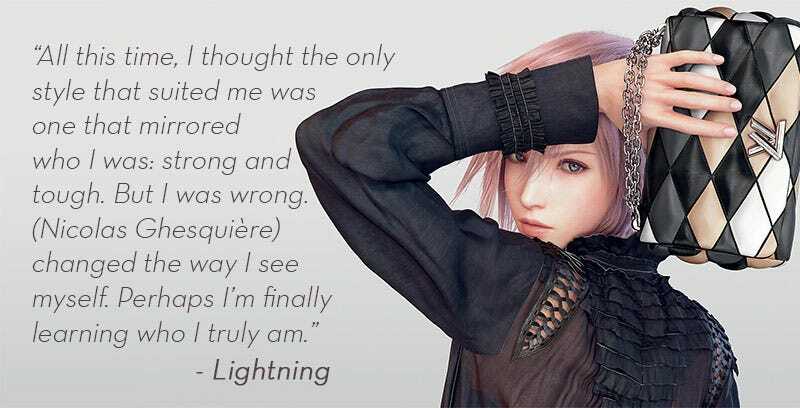 According to the complete nonsense I desperately want to believe is real in terms of Final Fantasy’s fictional universe, it was the work of Nicolas Ghesquière that changed Lightning’s attitude towards dressing up. If this were a more informal interview instead of a simple Q&A, I imagine Lightning giggling girlishly at her use of her own name in that comparison and then stabbing her interviewer in the chest with the blade she’s used to slaughter thousands of men, women and monsters over the course of her three game series. Seriously, what is her neck doing here? The interview touches on Lightning’s feelings about other famous models (“I hope that one day, we can share the same stage, that different worlds can come together”) and what it feels like to be a Louis Vuitton ambassador (“It makes me feel excited, a feeling similar to when I venture to unknown lands”) but fails to touch on how her extensive experience walking in a straight line benefits runway work. As ridiculous as all of this is, I desperately want it to be canon. Those of you familiar with the ending of Lightning Returns: Final Fantasy XIII know it could work. Right place, right time, that sort of thing. Sure it might mean no more games with Lightning in them, but perhaps it wouldn’t. Lightning: Not all that clear on how a Mobius Strip works. Until then, Lightning will be living the high life of a fictional fashion model, changing clothes and poses with the click of a mouse. LV is a new adventure―a new fantasy―that I will enjoy from the bottom of my heart.